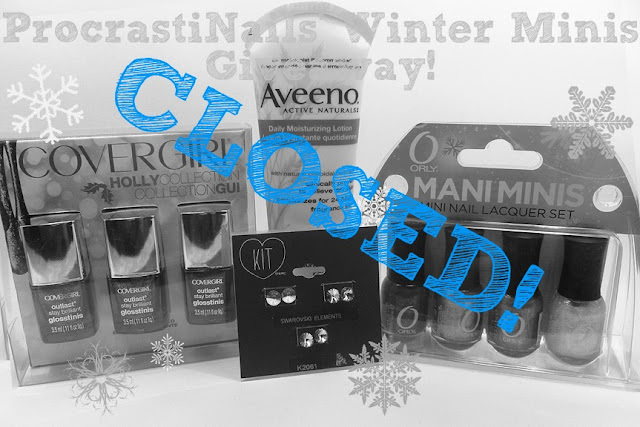 Announcing the Winner of the ProcrastiNails Winter Minis Giveaway! Thank you so much to everyone who entered this giveaway and made it a success. :) It was too bad I was having issues with being sick/having no power for a good chunk of the time it was running, because I would've liked to have spent more time interacting with you guys while it was open. (Oh well. There's always the next giveaway, right?) For now I'll just share with you the winner, which is.... *drumroll* Entry #22 from Colleen F.!! Eeeee, CONGRATS Colleen! :D Check out her blog @ Dream It Up Nails! Speaking of my next giveaway... If you're looking for a hint, I'd say the best word to describe it would be ..... Julep!